Area codes 201 and 551 are telephone area codes in the North American Numbering Plan in the U.S. state of New Jersey. Area code 201 was the area code assigned to the entire state of New Jersey in 1947, when the North American area code system was formulated. After splits in 1958, 1991 and 1997, it covers the northeasternmost portion of the state, including most of Hudson and Bergen counties, bordering the Hudson River and New York City. Major cities in the numbering plan area include Bayonne, Jersey City, Hoboken, Hackensack, Secaucus and Englewood. Area code 551 is an overlay code to the same numbering plan area that was installed in 2001. Area code 201 was the first-assigned numbering plan area (NPA) code of the original NPAs when AT&T devised the North American Numbering Plan in 1947. It was also the first area code with Direct Distance Dialing (DDD) service, when in 1951 the first direct-dialed long-distance call was made from Englewood, New Jersey to Alameda, California. Area code 201 originally covered the entire state of New Jersey, despite the state's dense population. The bulk of New Jersey's population is concentrated in the large metropolitan suburbs of New York City in the northeast and the suburbs of Philadelphia in the southwest. The creation of numbering plan areas was based on the anticipated number of central offices needed in each area and one plan area could only accommodate slightly over 500 central offices. In 1958, 201 was restricted to northern New Jersey, while the area from the state capital, Trenton, southward, including the southern Jersey Shore and the New Jersey side of the lower Delaware Valley, received area code 609. For the next 33 years, area code 201 served Bergen, Hudson, Ocean, Essex, Union, Morris, Passaic, Hunterdon, Somerset, Middlesex, Monmouth, Sussex and Warren counties, a region largely coextensive with the New Jersey side of the New York City area. As the central region of New Jersey grew during the 1980s, the northeastern section of the state lost sizable portions of its population due to the decline of its major cities, including Newark, Paterson, Clifton, and Elizabeth. 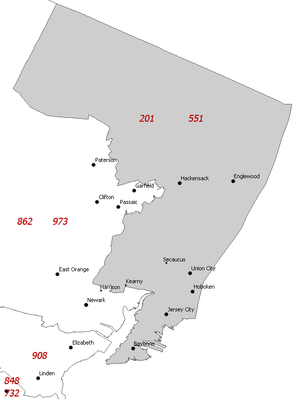 On June 8, 1991, area code 908 was split from 201; it primarily serves the north-central regions of the state. Within four years, 201 was close to exhaustion once again due to the proliferation of cell phones, pagers and fax machines. The supply of numbers was further limited because the entire northern half of the state is a single LATA, meaning numbers in 908 were not available for use. 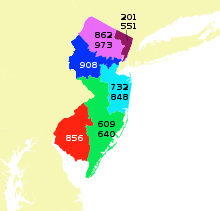 On June 1, 1997, Essex and Passaic counties, home to Newark and Paterson, respectively, the state's largest and third-largest cities, as well as Morris and Sussex counties, were split off as area code 973. This left Hudson and Bergen counties, the two most densely populated counties in the state and the closest to New York City, as the only counties in the 201 plan area. The 1997 split was intended as a long-term solution. However, demand for new numbers continued in Hudson and Bergen counties, and it was apparent the area would need another area code. Verizon, the dominant telephone company in New Jersey, lobbied for an overlay rather than a split. Overlays were a new concept at the time, and were controversial because they required implementation of ten-digit dialing. However, Verizon wanted to spare its customers the burden of changing telephone numbers. Area code 551 was created in 2001 to overlay 201, along with area codes 862 and 848, which overlay area codes 973 and 732, respectively. With the implementation of the overlay area codes on December 1, 2001, ten-digit dialing became mandatory in Northern New Jersey. ^ a b 1951: First Direct-Dial Transcontinental Telephone Call, AT&T Inc., accessed May 12, 2007. ^ a b About Verizon New Jersey: Years 1985 to 1998 Archived November 13, 2007, at the Wayback Machine, Verizon Communications, accessed May 12, 2007. ^ McKay, Martha. "New Jersey Assigned New Area Codes. ", The Record (Bergen County), April 18, 2001. Accessed August 11, 2001. "The new New Jersey area codes -- 551, 356, and 848 -- were announced this week and will be introduced next year in the regions currently served by 201, 973, and 732, respectively." This page was last edited on 4 November 2018, at 12:56 (UTC).